A visit to Rancho Obi-Wan is a distinctive interactive experience unlike that offered by any other museum, exhibit, archive, or memorabilia collection. The museum houses the world’s largest private Star Wars collection and tours of the private collection are guided by one of our highly skilled docents. If available, owner Steve Sansweet visits at the end for questions, photographs and autographs. Rancho Obi-Wan appeals to avid Star Wars fans, who can spend hours asking questions on topics ranging from action figures to screen-used props. 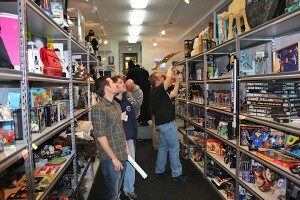 The museum also attracts non-core fans with exhibits that show the interaction of Star Wars and popular culture, the immense changes in technology and the workplace that happened in less than four decades, and the worldwide reach of Star Wars as seen through the lens of international culture. Even those with just a casual interest in Star Wars will appreciate the outstanding quality of the visuals and immersive environments, along with all the stories. Everyone has a chance to challenge their skills in the Star Wars Arcade, where fans of all ages can play vintage video games and pinball machines, all set on free-play! 1. Please read our tour policies. 2. Tours are limited and are typically booked to capacity 6-8 weeks in advance. We would advise booking well in advance or very swiftly if you see availability nearing capacity. We are not open to the general public and drop-in visits are not allowed. 3. Add a Membership to your shopping cart if you are not already a member. 4. Add tour tickets to your shopping cart. Tours usually start at 10am (sometimes 2pm) and last between 2 and 4 hours. Tours with one of our excellent docents are $85.00 each. Younglings ages 6-12 are $25, one adult required for every two younglings. It has been our experience that Younglings under the age of six typically become bored, fidgety and disruptive because tours can be long and the subject matter rather in-depth. At this time we do not have Disneyesque interactive experiences to hold their attention. To encourage a quality tour for all our guests we do not recommend Younglings under the age of six attend the tour. 5. Email info@ranchoobiwan.org to confirm your tour.